Why o why do I look at the weather forecast? I did look, and was assured that Friday the 29th and Saturday the 30th was going to be dry, warm and have white cloud cover. Friday was a bit bright, but I thought that they must get it correct for Saturday. 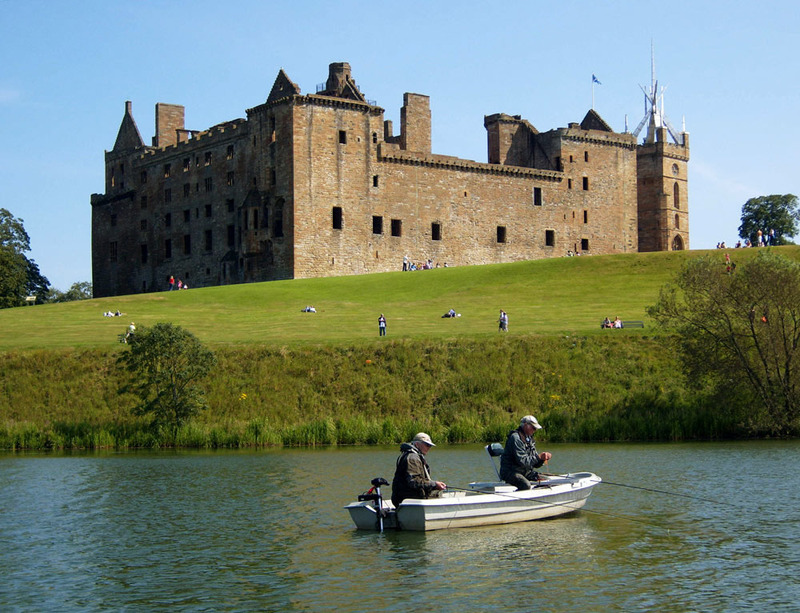 So Saturday arrived – dry, warm and bright, with not a cloud in the sky – but on this visit to Linlithgow, I had a secret weapon – advice from a friend. My random number system for selecting boat partners had paired me AGAIN with John Levy. I considered cheating and rerunning the selection, but didn’t – thinking I may as well just get back to disputing everything each other says about everything. But this time it was different, all sweetness and light. We agreed on tactics, we agreed on flies, we agreed when we should change lines, we exchanged flies, we even offered each other food – we agreed on everything – the best way to describe the day was it was like an episode of Last of the Summer Wine. We even agreed that we would fish together in the future. 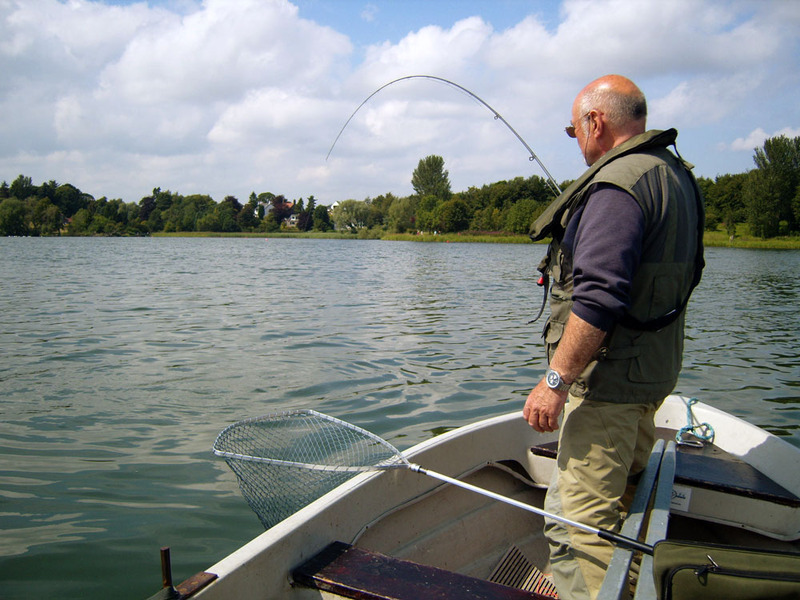 So now to the fishing – The water was showing a distinct shade of green – sticking the rod tip into the water indicated you could see down about three feet (call it a meter for the young chaps). Water temperature was 20C & the air temperature at the start was 19 climbing to over 22C at mid afternoon. John and I (heeding the good advice) started with DI-7’s and the biggest boobies we had. Almost immediately I had a strong fish, but had to kill it to get the fly back. Then John had one on that ran like a train, stripping line and backing from his reel. He just couldn’t stop the thing – then the inevitable – it came off. Not to be deterred he just started again and soon pulled out three fish. I had caught and killed another by this time. Now we had five fish in the boat and we decided to change tactics to slow the flies down. We agreed that a ghost tip would be the answer, but neither of us had a ghost tip – so we decided to put polyleaders onto the front of our midge tip lines. This is what we did, tying on a cast of nymphs and fishing with a very very slow retrieve. It brought another three fish to the net. We also lost some using this method. Therefore, the good advice paid off for us. Trevor Gibson and Alan Holbrook were paired. They emerged top boat with 14 fish between them. Remembering Trevor’s success last time and the position he was on the Loch – I scooted to this spot before he could get to it, but he just went to the West of the island and put his anchor down in a spot that had about eight feet of water behind the boat and about seventeen feet of water in front of the boat. Trevor used a ghost tip with buzzers and diawl bachs. Alan used a ghost tip with buzzers and nymphs. Both used a very slow figure of eight retrieve. Dougie Goddard anchored at the Palace deeps and, using a Hi-D with various flies – booby, FAB and buzzers – caught six – I am sure he could have got more but his pipe went out. His boat partner, John Miller, had two, using a sink tip line along with FABs and Diawl Bachs. Bob Allan, paired with Jim Walker, anchored in the main basin. Bob, using a sink tip line and Diawl Bachs, extracted six fish. He also used a very slow or static retrieve. Jim did not do so well and I think we should just skip over this, but to his credit, he still had a good day. Stewart Barnes, fishing just under the Palace (with the number of boats crowding the main basin I do not think he could get anywhere else) caught two using a DI3 with black crunchers and damsels. 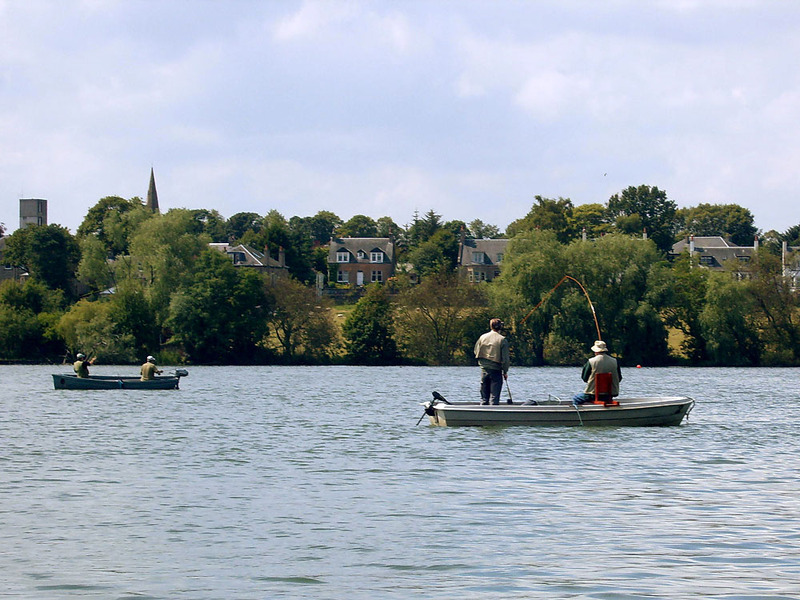 His boat partner John Robertson handed me a card with a big angry looking nil on it – I thought it best to say nothing. The Club’s ten fishers had 38 fish – 26 were killed and these weighed a hefty 68 pounds.